It was a Happy Saturday when I decided to document this Port. We hadn’t had much to do this day. All of the chores were done and since it’s winter, we couldn’t go outside. I truly can’t wait till spring! I had recently bought a bottle of 2009 King Coal from Sunfish Cellars in St Paul. Chris and I along with Dave had made the journey to St. Paul for a light snack in the wine bar and to pick up my special order bottle. The Wine Bar at Sunfish Cellars is very nice. They have a pretty good wine list and the appetizers and sandwiches are priced right! We enjoyed a small pizza that was on special that day, and Chris and I also shared a Caprese sandwich. Dave enjoyed a Reuben. After a glass of wine and lunch we headed over to the liquor store to have a look around and pick up my wine. As we wandered around we found Dave by the port section. 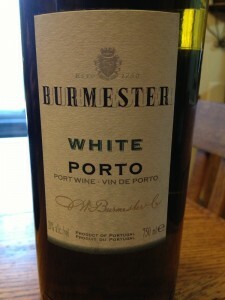 We began talking to one of the staff members and Chris decided to buy a bottle of Burmester White Porto. I forget the gentleman’s name but he explained that he is a fan of Gin and Tonic. He likes to have a glass the first nice day of spring. However, the recommendation he was about to tell us has become his new spring favorite! He says to take a shot or so of the Burmester White Port. Add tonic water with a sliced Lemon. I guess it does sound pretty darn good and refreshing on a warm day. Along with Dave, we decided give the White Port a quick try. 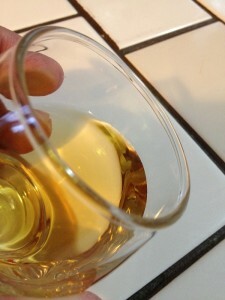 The white port is pale with an Amber Green Hue. The white port was very aromatic in out little glass. We could smell Brandy and Citrus fruit. Sweet as you would suspect. Medium bodied and the acidity was flabby. The tannins were week and soft and it was quite flavorful. There was no dominant fruit flavor. It just tasted a little fruity. You could feel the light tannins on the roof of your mouth while the finish was long and slightly bitter. I would not recommend this as a sipping port. I do plan on trying it again with a touch of Tonic and a sliced Lemon as suggested on a hot spring day. I guess another blog and hopefully the recommendation will be great!